A Wells Fargo stagecoach on display at the Wells Fargo History Museum in Des Moines, Iowa. 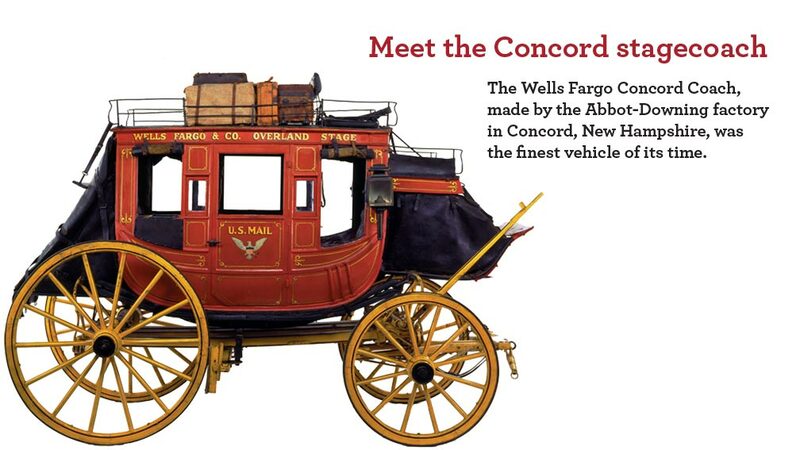 The history, design, and enduring allure of the red Wells Fargo stagecoach. More than 166 years after Henry Wells and William G. Fargo came together to provide banking and express services to western pioneers, the red Wells Fargo stagecoach endures as a symbol of the opportunity, innovation, and perseverance that defined that American era. Advertisements for Wells Fargo stagecoaches in 1867 listed a 15-day journey between Sacramento, California, and Omaha, Nebraska. And though the stagecoaches are no longer crisscrossing the country to deliver passengers, gold, and other goods, they are still everywhere. You can see them in person: The stagecoaches are on exhibit at Wells Fargo History Museums, and on the streets in our cities and towns — they’re part of the Rose Parade and more than 700 other events each year. You can see them in pictures: Wells Fargo documents often display imagery of a stagecoach, driver, and horse on the move, and stagecoach images also are featured in bank branch murals as part of Wells Fargo’s Community Mural Program. You can see them in miniature: From their shop in the small town of Menifee, California, brothers Robert and Jorge and mother Maria Cortes are a stagecoach-building family that crafts about 1,800 wooden stagecoach models — by hand — each year for Wells Fargo. The models are given to customers and team members as tokens of appreciation. And you can see them in the air: There’s even a stagecoach-shaped balloon that goes aloft each year at the Albuquerque International Balloon Fiesta®. It’s a favorite among balloon enthusiasts. In July of 1852, during the gold rush, Wells and Fargo opened their first West Coast office in San Francisco, turning Wells Fargo into a national company just a few months after it was founded. Wells Fargo & Co.’s agents soon followed their customers into the mining camps and settlements that seemed to pop up almost overnight. The agents, who provided banking services, needed a way to transport gold, mail and other goods, and passengers securely. Enter the stagecoach. Wells Fargo’s stagecoach legend traces its roots to 1858, when Wells Fargo founders including William Fargo were board members for The Overland Mail Co., the nation’s first transcontinental stagecoach line. Passers-by in the Southwest could find The Overland Mail Co. stagecoaches twice a week on their routes between Tipton, Missouri, and San Francisco. During the Civil War, the route moved to the center of the country, and, in 1866, Wells Fargo combined the route with the other major lines of the day to create the largest stagecoach empire in the world. Concord coaches weighed about 2,400 pounds and cost $1,100 each, including leather and damask cloth interior. In its own way, the Concord coach crafted by Abbot and Downing that came to represent Wells Fargo was every bit as innovative in its time as Wells Fargo innovations in the 21st century — whether that was becoming the first bank to offer secure account access to internet banking customers in 1995, or the soon-to-be released “Control Tower” feature to allow mobile and online customers to manage their financial lives from a single location on their phones, tablets, or computers. “Abbot and Downing seized on the idea of thoroughbraces — a technological innovation in stagecoach design — where the curved frame of their new and roomier coaches rested instead on thick bullhide leather straps that absorbed the shock of the road and dampened the coach’s motion in relation to the running gear,” he said. Mark Twain, in his book Roughing It, fondly called the innovative stagecoach “a great swinging and swaying stage, of the most sumptuous description — an imposing cradle on wheels” because of the advance it represented in comfort and the gentle rocking motion, Wakefield said. The stagecoach body was suspended by leather thoroughbraces that provided comfort to passengers and served as a buffer to the undercarriage, easing the load for horses. Today, the Abbot-Downing legacy remains a significant part of Wells Fargo. Given the company’s reputation for high-quality craftsmanship, innovation, and customer service, Wells Fargo decided in 2012 to name its newly branded boutique for ultra-high-net-worth clients Abbot Downing. Andy Anderson, historian and head of the Wells Fargo Family History Center, suggested the name for the new brand. “It was a wonderful metaphor for what we were trying to build, and tied in very nicely with Wells Fargo,” said Jim Steiner, head of Abbot Downing. Wakefield, who drives his team to bring the stagecoach experience to life about 30 times a year for Wells Fargo (along with running his own training center for horses and drivers), considers the stagecoach and horses a “living icon” for Wells Fargo. People love to see it, he said, and they always want to know more about stagecoach travel. That’s why Connie Whalen puts the stagecoach at the center of the experiences she creates for the company’s museums as part of the Wells Fargo Heritage Marketing and Museums team — including at the Wells Fargo History Museum in Phoenix. “I have always thought of our museums as a unique experience because they’re free, and people come in voluntarily to learn about our company,” Whalen said. “The stagecoach is the key,” she added, pointing to online reviews from travel sites as proof.